Kirk has been a tremendous member of the PowerGUI team, and when your position gets cut it is not fun at all – so I understand the tendency of us seeing this as the “big evil ungrateful corporation doing bad things” kind of thing. At the same time, I don’t think this is what actually happened. For many years Quest has been the major contributor to the PowerShell community and this contribution continues. Yes, being a public company Quest has to protect the interests of its shareholders and when the economy is not doing well some of the expenses have to get cut, and PowerGUI became one of the products which budget got adjusted. This is the sad reality here and such things happen. From what I know, Quest handled this unfortunate situation quite well giving Kirk a good package and offering options to stay involved. Back in 2006, in the Monad days, Quest supported me: giving me the investment I requested, and allowing me to spend my work time to start PowerGUI and AD cmdlets development. These tools were created free and remain free. You are not even required to provide your email address and get marketing emails for using the tools. For a lot of IT professionals I know – their PowerShell life started with either (or both) of these tools. I have met many Active Directory administrators who told me that QAD cmdlets literally had changed the way they work. 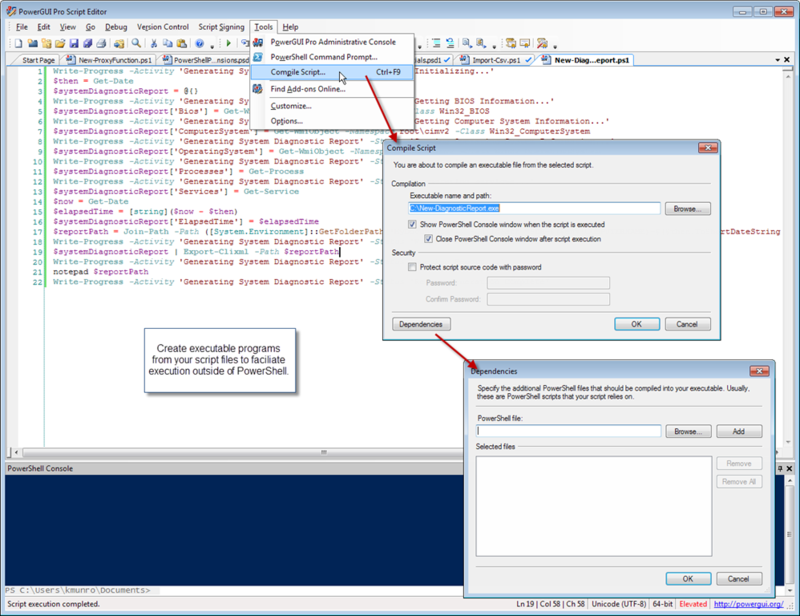 PowerGUI VSX is our free and open source effort to bring PowerShell into Visual Studio. PowerGUI.org website – again, created and maintained with Quest investment, is the most active PowerShell community in the internet (more active than Microsoft’s PowerShell newsgroups) – where many people get their PowerShell questions answered every day. Quest is the major sponsor of the PowerShell Deep Dive – which remains significantly subsidized (just check out the discount you get there compared to regular TEC price). Anyone who was at the event can attest that this was one of the most advanced, intense and amazing PowerShell experience they’ve ever had. From what I know, in none of these efforts Quest is abusing the relationship. Instead the company keeps doing what it can to give back to the community and make lives of IT professionals easier. From my personal perspective, my career and visibility in the IT community got catapulted to stratosphere thanks to these investments. Seriously, how many IT pros knew about me or Kirk before PowerGUI and AD cmdlets? Both of us became celebrities thanks to Quest’s contributions to PowerShell. So, am I sad that this happened and Kirk had to leave? Absolutely. I enjoyed working with Kirk and he is a good friend of mine. And yes without Kirk, the rest of the PowerGUI team including myself will have to work harder to keep the project advancing. Does this make Quest evil, greedy and bad to the PowerShell community? I don’t think so. I really don’t see any companies besides maybe Microsoft investing so much in keeping PowerShell growing, and I think we should all keep that in mind. If you guys like what we are doing here at Quest for the PowerShell community – help us: buy the commercial versions of the products, be active in our forums, spread the news and love towards these efforts – this will help us keep going and protect us against any further cuts. If this got you interested, you can download the NetApp PowerPack for free here. Yet, this is exactly what Windows IT Pro magazine has just published. And they were reviewing version 2.4 – without all the 3.0 functionality taking PowerGUI to the new level. Saying that I am excited would probably be an understatement. And this is even better, Ryan Femling from Windows IT Pro was actually actively using the tool – rather than relying on some sort of vendor marketecture (I did not even know this review was in the works) and his review is solely based on his scenarios and applications he found to be important for his work. Read full review here and I bet there is a good chance that you might learn a couple new things even if you are already an active PowerShell or PowerGUI user! [UPDATE] This issue has been fixed in AD cmdlets 1.5.1 – please download the latest version of AD cmdlets here. You execute a script which is using QAD cmdlets. The first time the script executes fine. However when you try to execute it again, the script fails with the “Object reference not set to an instance of an object.” error. The issue is related to the way QAD cmdlets are handling initialization and unloading of the snapin. 2. Select the Run all scripts in the same runspace option. 3. 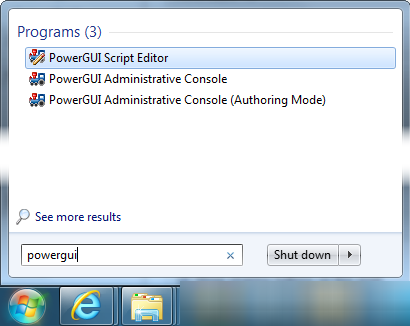 Restart PowerGUI Script Editor. We are sorry for the inconvenience and are working on fixing the issue in the next releases. If you experience intellisense issues when working with Exchange cmdlets in PowerGUI Script Editor (and by issues I mean that you have the Exchange snapin selected in File / PowerShell Libraries, and cmdlets work in your scripts just fine but intellisense does not appear) – suffer no more, there is now a fix available. 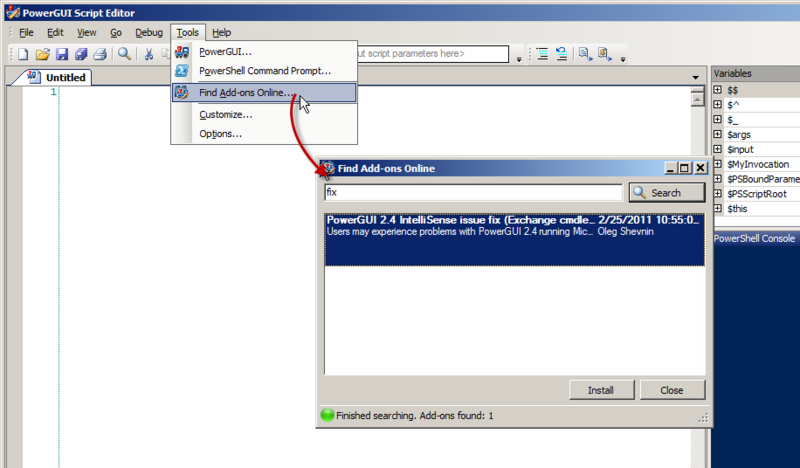 Select and Install the PowerGUI 2.4 IntelliSense issue fix (Exchange cmdlets).